"Log Me In" is an elegant in-page login manager similar to Opera's Wand login. Log Me In is Android and e10s Friendly. The extension displays in-page submit button when a login form is found and you have already stored at least one credential for this host. If more than one match is detected, a selection prompt will be displayed. The login process is automatic and there is no need to manually click on the submit button once the login is selected. LogMeIn supports keyboard login for mouse-less browsing as well. Please check https://addons.mozilla.org/firefox/addon/log-me-in/versions to see the logs of the new update. Why do I need Log Me In? What are the differences with the old Secure Login extension? Secure Login is written in XUL and is very dependent to direct communication with Firefox windows. Multi-core architecture (e10s) has been recently introduced in Firefox which makes it really hard to make Secure Login 100% compatible with this new communication methods. Although I still maintain Secure Login, but there was a need to start a new project based on addon SDK to be compatible with both the new architecture and Android. Log Me In does not have any XUL window, instead it injects a big key icon to the pages supporting authentication, makes it simple even for users on touch screen displays to select credentials. How does Log Me In work? Contrary to Secure Login extension, Log Me In does not iterate over all the login forms in the page. Based on our experience with Secure Login, this method is very slow and causes Firefox to slow down for the moden complex pages. Instead, Log Me In uses query selectors to find only matching forms. Why Log Me In is sometimes not available in some pages, although I am sure there are login credentials already stored in the Firefox password manager? To prevent Firefox slowness, Log Me In uses query selectors to find login forms. Most likely, the name of login or password field in the page has been changed and this is the reason why Log Me In cannot find the proper login form. To fix this, simply remove the stored password from Firefox password manager and restore it one more time by manually entering the credentials in the login fields. Next time Log Me In will be available. Alternatively, you can use Saved Password Editor extension to manually fix the login or password field. The extension even offers auto detection for both password and login fields. Is Log Me In safe? Well, it is as safe as Firefox password manager. Log Me In does not store any password internally, instead it searches Firefox password manager for matching credentials. How can I export my passwords to a new Firefox? What else does Log Me In offer rather than auto login? Log Me In displays the number of available logins for the currently open page in the toolbar button. Also by pressing the toolbar button, there are two useful tools there. 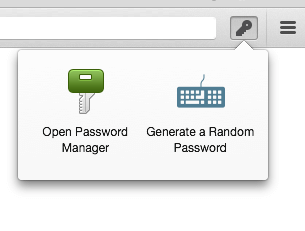 You can either open Firefox password manager directly to alter your login info, or generate a secure random password.